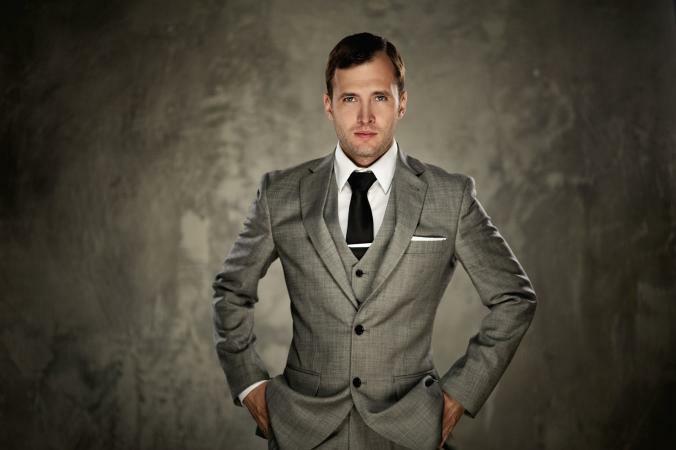 Three piece suits for men are classic suits with a very powerful appeal. They consist of a pair of trousers, a waistcoat or vest, and a jacket. Three piece suits for men are a classic blend of style and edginess which always complements professional dress, and, of course, by taking off the jacket, you can casually lounge at a nightclub still looking polished without trying too hard. If you wear suits frequently, opt for solid colors. Both the suits and classic colors are staples when building your wardrobe. Stylists advise owning suits in gray, beige, and blue. Go for basics and neutrals since black can look too harsh and tan can appear too traditionalist. For a business suit that makes an extra statement, go for pinstripes. When choosing three piece suit fabrics, consider those that are appropriate for the climate, as well as those that are durable and comfortable to wear. Wool is one fabric that comes highly recommended. Basic fashion truth suggests that the greater the content of wool, the better quality the piece of fabric will look and feel. Wools come in 4 varieties: flannel, worsted, tropical, and tweed. Those living in locations with warmer climates should opt for tropical wool. Polyester may be a cheaper type of fabric but only settle for a polyester suit if it resembles wool or is blended with other types of fiber. One good thing about polyester is that it doesn't wrinkle as easily as wool, so polyester suits are perfect for jetsetters. Choosing the best fitting suit for you is just as important as buying the right fabric and pattern. The waist of the pants should be fitted enough not to show fabric bulges under the belt area but still loose enough for you to insert your hand. You should feel comfortable when seated.The vest should fit you smoothly. It shouldn't sag or balloon when you sit or stand. The vest should be long enough to touch the front of your pants and your shirt must not peak out in between the pants and vest. Check how you look while standing and sitting to see if there are any problems. A slim-fitting suit will not only make you look stylish, but also taller and more confident as well. At Mens Suit Habit you can sort their collections according to prize, size, color, and designer. They also provide tips for online shopping. Suitsmen.co.uk offers a comprehensive collection that can be sorted according to color, fabric, occasion, brand, trouser type, chest size, and jacket length. A Suit That Fits offers a comprehensive line of three-piece fabrics and options. Customize your look by creating your very own three-piece suit. Simply choose a garment from their catalog or get inspiration from their collection of suits or from their customer reviews. Whether you buy a suit from a store or online, you may want to get the suit professionally tailored before wearing to ensure the perfect fit. This relatively low-cost investment will ensure that you look professional, stylish and sophisticated in this special type of menswear.